Alabama is home to 73 amphibians, including 30 species of frogs and 43 species of salamanders. 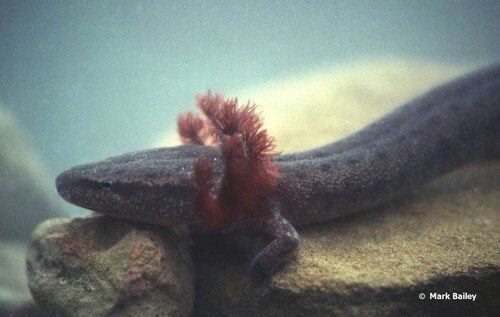 Black Warrior waterdog Necturus alabamensis: The Black Warrior waterdog is an aquatic, gilled salamander that is found above the Fall Line within the Black Warrior River watershed in Alabama. This nocturnal creature feeds on fish eggs, small fishes, crayfish, worms, and aquatic insect larvae and lives in moderate to large streams. Tennessee Cave salamander Gyrinophilus palleucus: The Tennessee cave salamander breathes through its skin and requires excellent water quality. It is known from the southern Appalachian Mountains in the Tennessee River draining in Alabama. This species lives in or around limestone caves and sinkholes. 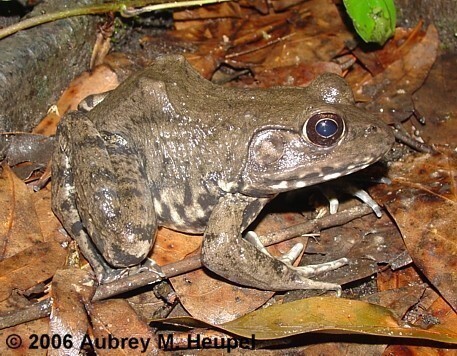 River frog Rana heckscheri: Located in the Choctawhatchee-Escambia subregion in Alabama, the river frog lives along rivers and smaller streams in river floodplains and swamps. This species is very rare in Alabama, likely due to loss and degradation of floodplain habiatat. Lean more about Amphibians in Alabama at Outdoor Alabama. Reptiles are cold-blooded (body temperature is not internally regulated and therefore is similar to that of the external temperature), usually egg-laying vertebrates having an external covering of scales or horny plates and breath by means of lungs. Alabama is home to 93 native reptiles, including 12 lizards, 49 snakes 31 turtles and the American alligator. There are numerous aquatic turtles that utilize rivers and streams throughout the state of Alabama. Turtles are aquatic or terrestrial reptiles that have horny toothless jaws and a bony or leathery shell into which the head, limbs, and tail can be withdrawn in most species. They have dry scaly skin and enjoy basking in the sun. All species of turtles lay eggs. Can you see the Map Turtle (Graptemys sp.) hiding in this photo? Photo provided by Paul Freeman. 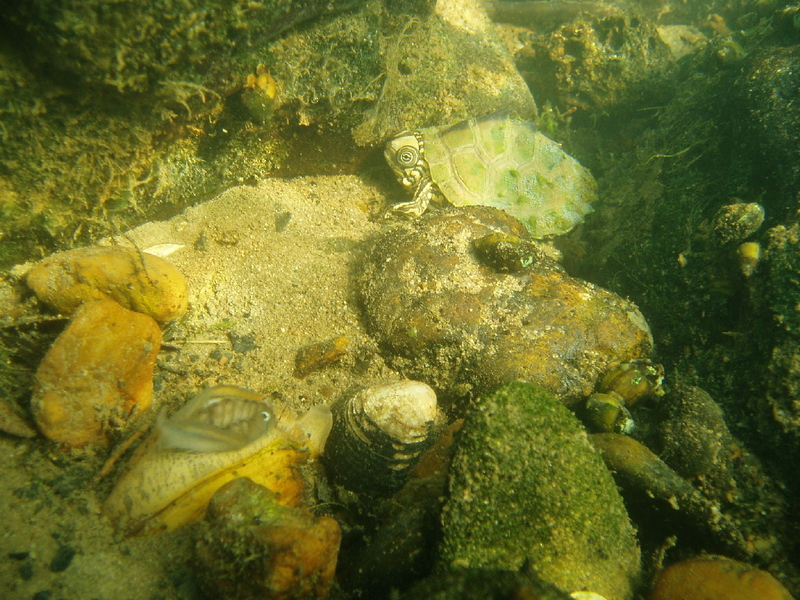 Also in this photo is a Mussel of the Lampsilis Genus. Learn more about aquatic turtles of Alabama at the Outdoor Alabama Turtles Page. 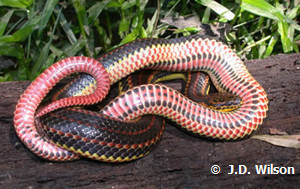 Rainbow snake Farancia erytrogramma erytrogramma: This semi-aquatic snake can be found in the Alabama River and the Choctawhatchee-Escambia subregions in Alabama. It prefers spring-fed runs, clear streams, and clear rivers and has been documents to tolerate saltwater habitats as well. Visit Outdoor Alabama to find more information on the Reptiles of Alabama. Outdoor Alabama, Alabama Department of Conservation and Natural Resources, Web.